❚ VINTAGE 2011 IS A MUSIC AND DRESS-UP festival indoors at London’s Southbank Centre (so without the mud), curated by Wayne and Gerardine Hemingway. This three-day party from Friday July 29 celebrates seven decades of British cool from the 1920s to the 80s. 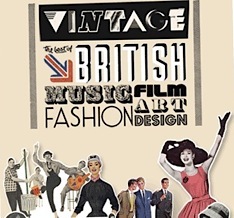 Taking its lead from the Festival of Britain (1951), the blurb says there is no single creative focus, just hours of music, fashion, film, art, design and dance each day. All levels of the Royal Festival Hall are transformed into a multi-venue playground, with ten vintage nightclubs such as The Soul Casino, Let it Rock, The Torch Club and The Leisure Lounge. New this year are The Studio, Prohibition Room, The Bunker Club and the North South Divide. In total there’ll be 70 live performances, 150 deejays, exclusive catwalk shows with Jo Wood and Pearl and Daisy Lowe; decade specific make-overs; vintage food and cocktails and 250 sellers at the vintage marketplace. Each day sees a major Revue in the main auitorium: Heaven 17, Alan Wilder and Thomas Dolby, for example, in Friday’s Electronic Revue… Percy Sledge in Saturday’s Soul Revue… David McAlmont, Sandie Shaw and more in Sunday’s Hit Parade. 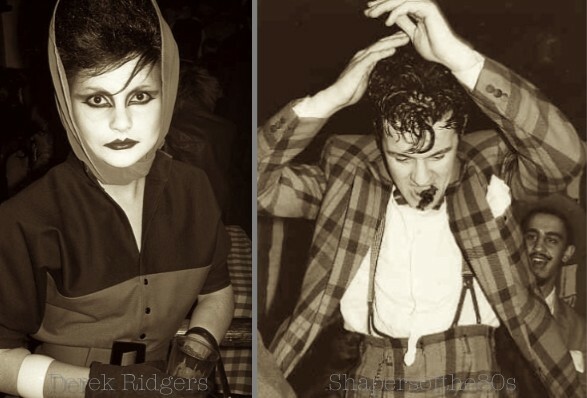 On Saturday the RFH Penthouse venue goes “back to the futurists” and the New Romantic Blitz Club era with 80s three genuine Blitz Kid super-deejays Princess Julia, Jeffrey Hinton and Mark Moore. Classic Album Sundays and Bowers & Wilkins present the Best British Albums at Vintage in four two-hour listening sessions each day in the St Paul’s Pavilion. At 7.30 on Saturday Mark Moore will be introducing Joy Division’s Closer album and the record will be played in its entirety (from vinyl of course) over fab B&W audio kit. Funk royalty: Chris Hill (left) plays the Vintage festival, but what about Robbie Vincent? For Sunday night in the Penthouse Chris Sullivan — the original Wag Club host for 19 years and Uber-Shaper of the 80s — recreates the funkier, post-Romantic spirit of Le Beat Route (1980–83, zoot suits) and the Wag (1982+ ripped jeans and Celebrity Squares) along with other gods among dance deejays Paul Murphy and Jay Strongman (who also plays Warehouse on Friday and Let It Rock, Saturday). Over in the Soul Casino the funk legend that is Chris Hill joins the legends who are Norman Jay and Colin Curtis. Tsssss! Have the Hemingways got any inkling of exactly how many galaxies of star quality they have booked? Ticket prices are frankly a sting, starting at £60 (wince! ), since you are the star turn at this DIY event, but dedicated followers of fashion not yet squeezed by the recession aren’t likely to complain. This entry was posted in Clubbing, Fashion, London, Pop music, Youth culture and tagged Blitz Kids, Chris Hill, Chris Sullivan, Concert, festivals, Interview, Jay Strongman, Mark Moore, New Romantics, Princess Julia, Southbank Centre, Sue Tilley, Vintage 2011, Wag club, Wayne Hemingway. Bookmark the permalink.